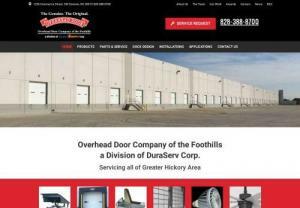 Overhead Door Company of the Foothills has been furnishing and installing, the highest quality residential and commercial garage doors, garage door openers, dock equipment, and accessories in the Hickory area for over 23 years. Our skilled technicians are meticulously trained to evaluate your individual problem, work with you to determine the optimum solution, and implement the best repair or replacement. Call us at 828-388-8700.